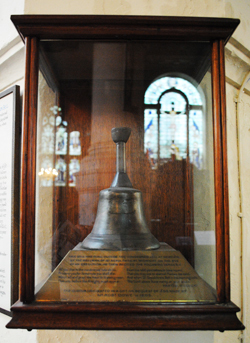 Contained in a glass cabinet within the walls of St Sepulchre-without-Newgate, this bell was traditionally rung 12 times outside the condemned cell in nearby Newgate Prison at midnight on the eve of an execution (ensuring, no doubt, that no-one had a good night’s sleep before their final morning). The tradition of ringing the bell apparently dates from 1605 and has its origins in a bequest of £50 made by one Robert Dow(e), a prominent member of the Worshipful Company of Merchant Taylors. (Dow had apparently wanted a clergyman to be the one to ring the bell but his money didn’t stretch that far). A rather grim piece of London’s history. If a criminal was executed quietly and secretly buried, the community would have learned nothing. So I assume this bell was rung 12 times outside the condemned cell in Newgate to inform citizens of the impending execution and to warn citizens what happens to those who break the law.